I Can See Clearly Now…WIAW!! As I was saying on Sunday, my food life has been a jumble lately, but I am in the process of working hard to get back on track. Sunday night after our birthday party, I allowed myself one last little fling. It wasn’t actually such a bad fling, but fling it was. 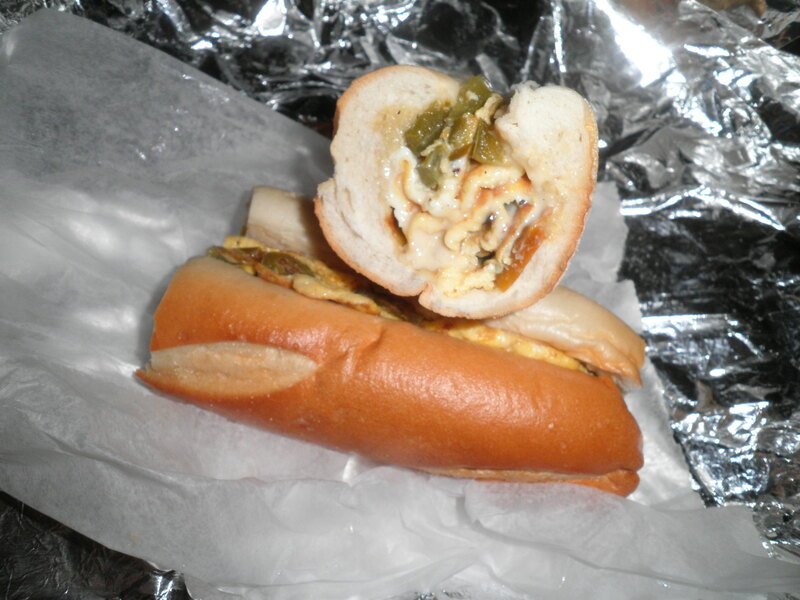 A yummy pepper and egg sandwich with American cheese from Picasso’s. My favorite takeout sandwich. I enjoyed it. But I won’t be seeing another one for a while. Monday morning, I was off to the races with being on track. 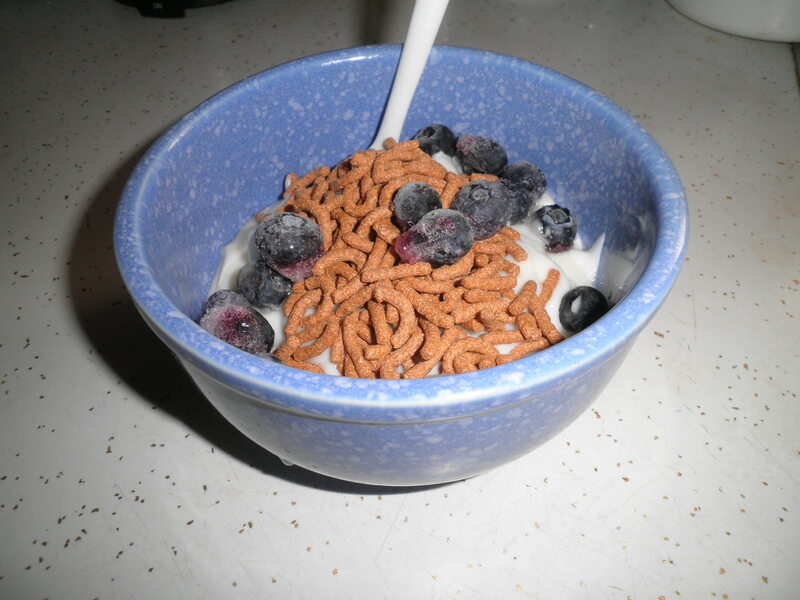 Fat free vanilla yogurt, Fiber One and blueberries I froze over the summer. I’m so glad I froze them. They will be delicious to use all winter. They’re really yummy in oatmeal! Last night I tried something new. 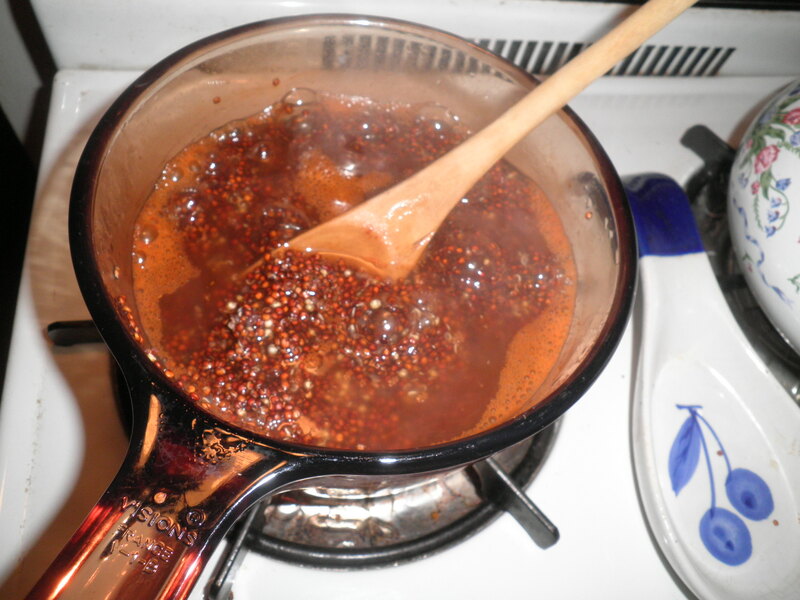 I love quinoa and I’ve had red quinoa in the cupboard for several months, but never made it. Last night, was the night. It looked so strange. Cooked it up in veggie broth. It tastes a little different from the white, but still tasty. Other salad fixin’s…pre cut bag lettuce. I really don’t like iceberg, but my friend Gail gave this to me before she left for Florida, so I used it. 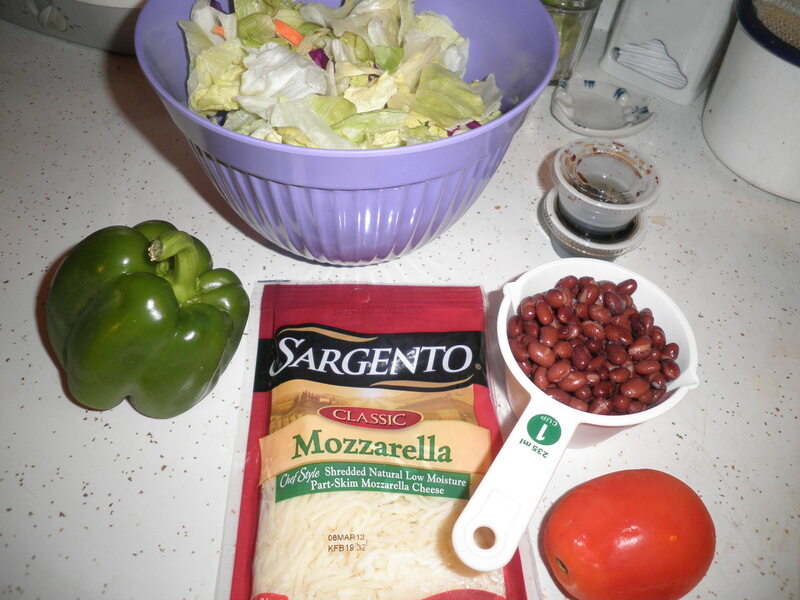 Green bell pepper, tomato, canned black beans, mozzarella cheese and leftover dressing from Picasso’s from last week. 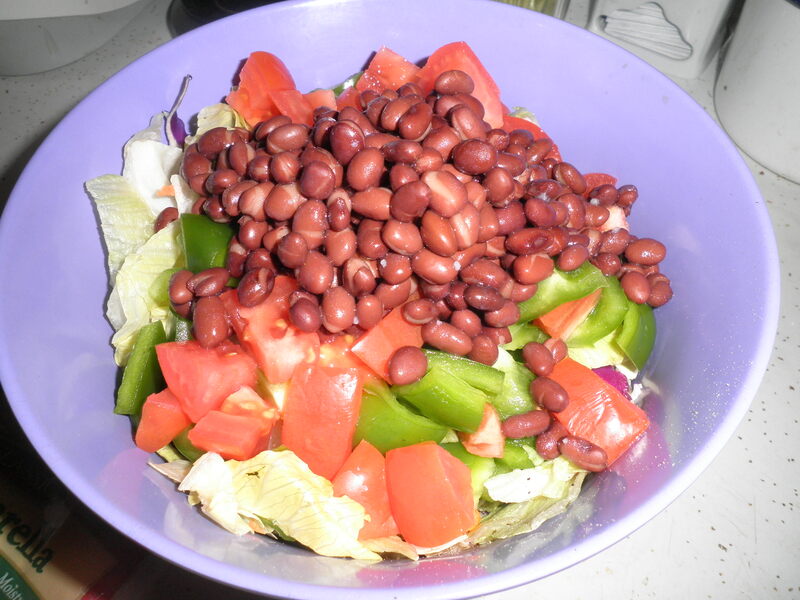 The lettuce did not taste that good and I realized that I am spoiled now with home cooked beans. The canned ones just did not taste as good. 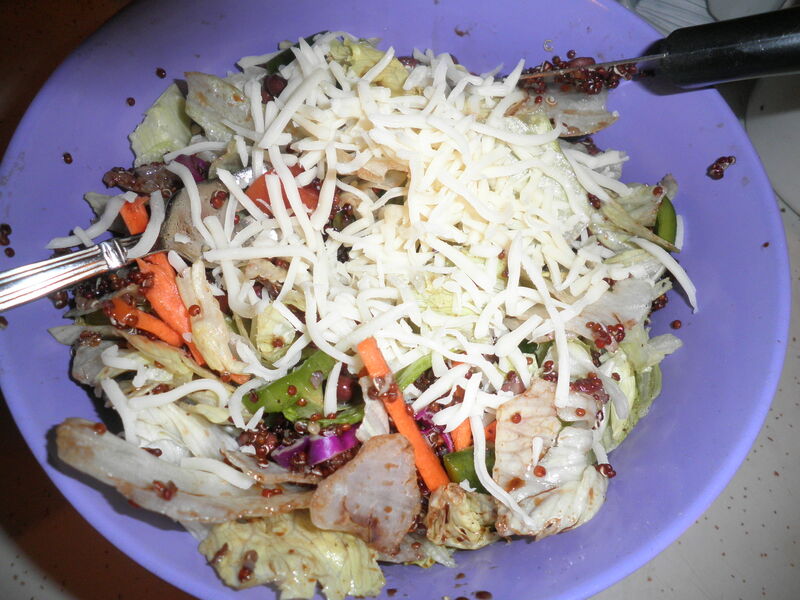 I love having my salads in my Big Purple Bowl. They are so satisfying that I’m not usually looking for a snack in the evening. That’s a good thing! 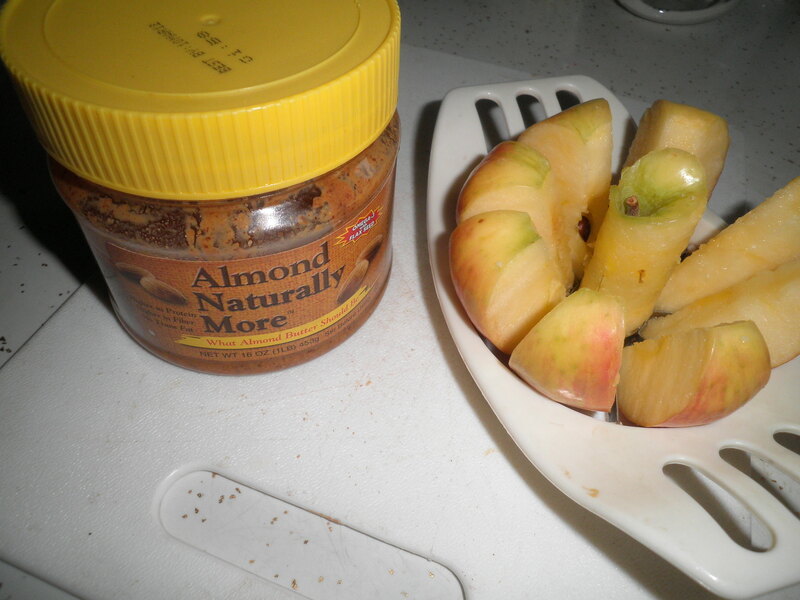 Tuesday AM, I was in a hurry, so I just divided a Honeycrisp and had it with some almond butter. It’s amazing how filling that is and it really held me. Short and sweet this week for WIAW. Just want you all to know that I am back on track with my food. Two days in a row on my exercise bike also. I feel better already. This entry was posted in Uncategorized and tagged beans, Big Purple Bowl, quinoa. Bookmark the permalink. I wish I could get hold of red quinoa a bit easier but it seems to be so hard to find here! Happy WIAW! 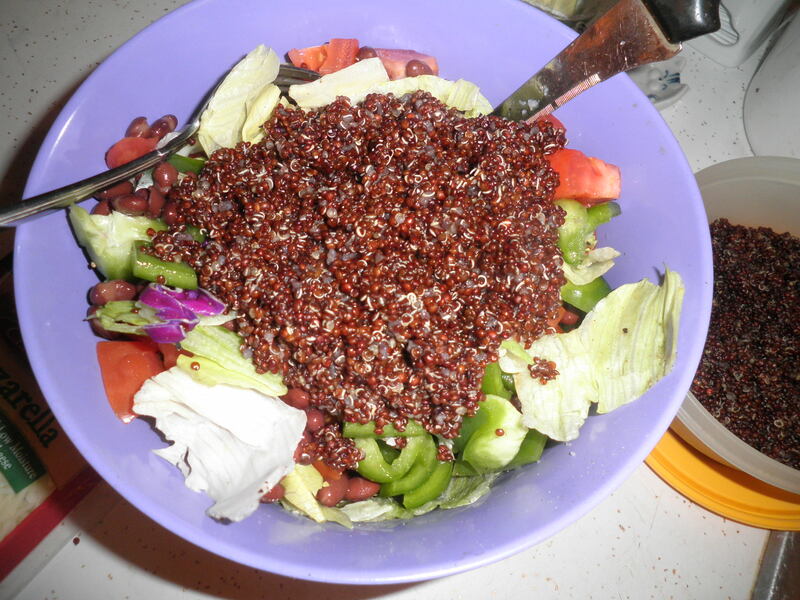 I tried red quinoa a few weeks ago and loved it. Salads are the best because anything goes. I, like you, eat them almost every day, I love them. I haven’t gotten any honeycrisp apples yet this season because all the other varieties have been on sale and the honeycrisps are double the price. But any apple and PB combo is great. I know how expensive the Honeycrisps are! I’ve only bought them when the were on sale. They are so good, though, their worth the extra cost! Yum to apple and PB!! Hi Mer! I agree, adding a grain does make the salad seem heartier. I can’t argue with the protein either and since my husband is always giving me a hard time about getting protein…I’m adding it!! Thanks! I never knew they made naturally more almond butter! I thought they just had pb!! I’ll definitely have to hunt for that 😉 Love the frozen blueberries in your breakfast too mmm! Hi Alexandra! Yes Naturally More makes almond butter. It’s the first kind I’ve tried and It’s very tasty! That salad looks soooo good!! Hi Andrea! Thanks for stopping by! I love salads and I eat them A LOT!! Thanks for visiting, please come back again! I love the PB Naturally More but have never found the almond version… So jealous! You’re the Best, Sarah!! I’ll look for it. Regarding the almond butter, I think sometimes it’s a regional thing, you find certain foods in certain areas. It makes me crazy seeing what some bloggers can find and I can’t. I’ll keep you posted about finding the Stonewall Kitchen. Thanks! Way to get back on track! Everything looks great. A honeycrisp apple and almond butter is one of my favorite meals of all time. They are usually so big that they literally are an entire meal! Hi Candy! Yes, the honeycrisp are wonderful and as you say Huge! Just about a tablespoon of some type of nut butter and I’m good to go…sometimes it’s breakfast, sometimes. lunch. Perfect! I love that take out sandwich, but I understand why you can’t have too many of those. It looks like you bounced back to the good side quickly and with some delicious eats. I love the look of the quinoa. Hi Rachel! That sandwich is the Best! I’m doing my best to get back on track. The quinoa was yummy but I think I needed to cook it longer than I do the white. Next time I’ll get it right! I have some mixed quinoa in my cupboard that I haven’t use yet – I must get on to that! Glad you like the looks of my food, Sarah, sometimes I think it doesn’t photograph that well. Hadn’t thought of mixing the quinoa, but since I have red and white, why not? I think the other is black. Not sure! It’s very tasty. Hi Tessa! 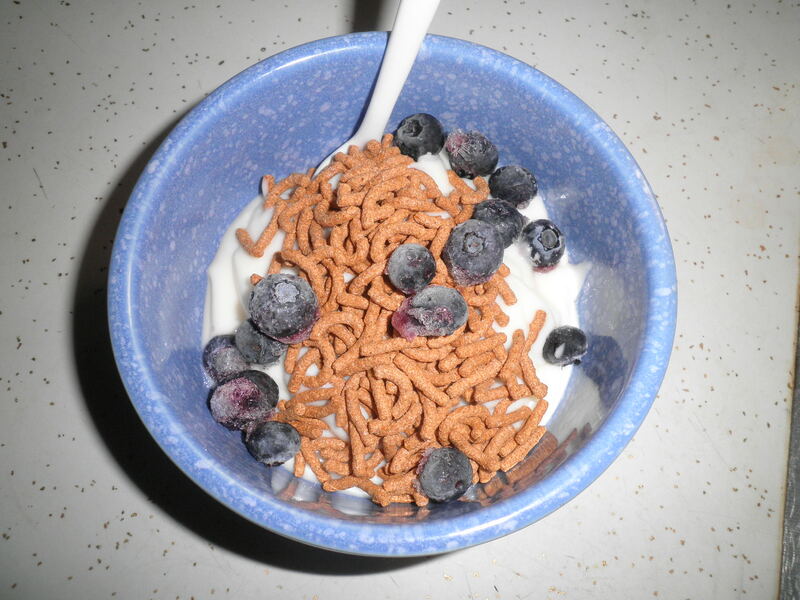 It is good and has lots of protein, so it’s a good choice for me! I cook it with veggie broth and I swear it’s good enough to just eat it with a spoon! I’ve never tried red quinoa. I do like apples with almond butter, though! Hi Stephanie! I think I like the white quinoa better, but it was still tasty. Would have worked well in a dish where you can actually SEE it!! 😉 Apples and nut butters are just the best! i actually have never made quinoa – need to give it a try! Hi Sara! Quinoa is very tasty. I’ve only ever cooked it in veggie broth, not sure if it would taste different done in water. It’s got extra protein in it too. I have seen the red quinoa but never tried it. How was it different? A more earthy taste? Way to go on the exercise bike!! hi Laura! It’s hard to say how the red quinoa was different. I think it needed to cook longer than the white, but I might just have been impatient the night I made it. I think the real difference would have been if it was in a dish where you could see it. I think nutritionally it’s the same but I’m not sure. Good point, I’ll have to check on that. mmmm honeycriso! I could eat them everyday! I tried red quinoa and was thrown off a little by the color too. Go figure! Hi Marcia! I only just found out about honeycrisp this fall. I am in Love with them! The color of the red quioa is a bit odd. It was pretty tasty though. Thanks for stopping by BCDC. Please visit often!